A judge in southern Italy is pioneering a programme to help children of mafia bosses to escape a life of crime - by taking them away from their parents at the first sign of trouble. "We needed to find a way to break this cycle that transmits negative cultural values from father to son," says Roberto di Bella, president of the juvenile court in Reggio Calabria, on Italy's southern toe. This is the heartland of one of the most formidable of the country's mafias - a criminal network known as the 'Ndrangheta, the biggest cocaine smugglers in Europe. Mafias are always built around blood ties - especially so in the 'Ndrangheta's case, making its clans particularly hard for security forces to penetrate. "There's a religious baptism and a mafioso baptism, which is confirmed when you reach a certain age," says Antonio Nicaso, who has written extensively on the 'Ndrangheta's family dynamics. "So this means that, often, the children of bosses - particularly the first-born - are predestined to follow in their father's footsteps." Daughters are sometimes compelled to marry the sons of other bosses, he says, binding separate clans together through blood relations. "There are letters from women who write about their daughters being forced to marry men they don't love, just to enlarge the power of the family," Nicaso says. Across the Straits of Messina the Sicilian mafia has been undermined by the so-called "Pentiti", the "penitent ones", who have collaborated with the police and informed on their fellow criminals. But the 'Ndrangheta clans have produced comparatively few turncoats - and codes of conduct are simply passed from one generation to the next. In recent years Judge Di Bella's court has been dealing with the sons of mafiosi who he sentenced as juveniles back in the 1990s. So last year he decided that something had to be done. "As president of the court, I took some decisions," he says. As well as family members, the 'Ndrangheta draws children from outside its clans into its ranks. "They go around the neighbourhoods scouting for the strongest, bravest kids, and they pick the best ones," says Antonio Nicaso. For a time these chosen children serve what amounts to a criminal apprenticeship. "They're followed to show whether they're trustworthy, then presented to the boss, and whoever presents them takes responsibility for them. "They make youngsters believe that the 'Ndrangheta is an organisation made up of special people, with a cult of respect and honour." And there is eventually an initiation ceremony. The oath-taking involves cutting the finger of the newcomer. Their blood is allowed to fall on a picture of Saint Michael the Archangel, who the 'Ndrangheta mobsters regard as their patron. "They set the image on fire and hold it in their hand while it burns, saying 'I promise to be faithful to this organisation, and should I betray it, I would burn like this Saint'." The court began focusing more on the children of well-known mafia families aged around 14 or 15 who had "started to acquire the mafiosi mentality", as Di Bella puts it, beginning with petty crimes. So far about 15 of these teenagers - the great majority of them boys - have been taken away from their relatives and placed in care homes. But they are not in prison and they can go back home for visits every few weeks. "This always starts with a court case," says Di Bella. "When these children are accused of bullying, of vandalising cars or police cars, and families do nothing, then we intervene. "Every time I have to take away a minor from a family it's a very tough decision, I have to make a deep judgement." But sometimes, he says, the court concludes there is no other option. "Our objective is to show these young men a different world from the one they grew up in," he says. "If you are a boy whose father, uncle or grandfather is a mafioso, then there's no-one who can set rules - and we provide them with a context." The hope is that when the youngster is free to go back home permanently - when he is 18 - he will chose not to enter the criminal underworld. It is not the first time youngsters from problem families have been placed in care. What's new is Di Bella's determination to intervene early, and to coordinate more closely with social workers, psychologists and others to give the children a fresh start. The programme is still being described as "experimental", and "evolving", but Di Bella says he expects a lot more youngsters will be removed from Calabrian mafiosi families in the months and years to come, and that the programme may be replicated elsewhere in Italy. The initiative is welcomed by Mario Nasone, a social worker with experience of dealing with 'Ndrangheta children. The juvenile court is looking at the issue in a comprehensive manner for the first time, he says - but he adds that the programme needs more state support. Maria Carmela Lanzetta is the unassuming mayor of a small Calabrian town who became a national symbol of the fight against the mob. When she resigned her post after months of intimidation - most likely by the 'Ndrangheta - the government gave her police protection and promised to help her achieve her goals. But 12 months on, she said enough, for a second and final time. "It has got worse. This should have been the year of stability. Instead it's a mess," she told the BBC. "We have no money; state funds have been frozen. We have had to declare the council bankrupt." "We need to create a network in which we can guarantee that these kids going into homes have a certain 'cultural detox'," he says. The mafia bosses Nasone and his colleagues visit in jail are aware of the authorities' new determination to intervene in families like theirs. "There's a certain amount of concern," Nasone says. "But we have to talk to them - make them responsible. They must understand that they cannot with impunity do whatever they want with their children - bring them up as mafiosi. We can't allow this." Nasone has seen for himself that with the right approach youngsters can be steered away from lives of crime. He tells the story of a 16-year-old he worked with at a detention centre. When it was time for him to leave, his mother said that he had to return to the family to take the place of his mafiosi father, who had been killed. 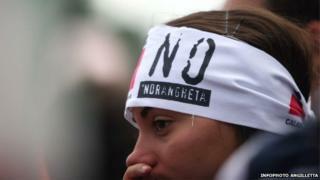 "You're with us or with them," she argued, meaning the world beyond the 'Ndrangheta. "He chose, and he went away to Milan," says Nasone. "We got him a job. But he had to cut off links with his family. These are not easy choices."